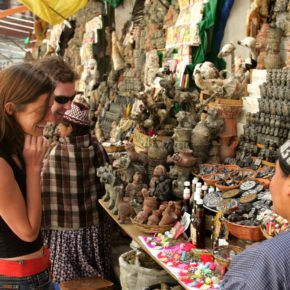 Our extended La Paz off the Beaten Track & Moon Valley walking tour highlights the best of the attractions we visit on our other tours, plus the lesser-known Zona Sur (southern district) and the Moon Valley in the outskirts of La Paz. 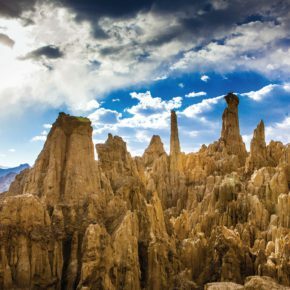 In this tour, not only do you get under the skin of the city by visiting both the city of La Paz and El Alto where the real Witches Market and a quirky shaman alley await, but also the wealthier southern district that houses the enigmatic Valle de la Luna. 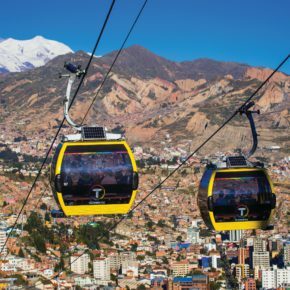 This offbeat tour of La Paz lets you experience the city hands-on, by foot and taking different forms of transport including the scenic teleferico cable car, in a day full of different experiences covering most of the city. Begin your tour in “Plaza de los Heroes” (Heroes’ Plaza) where San Francisco Church is located, full of history and interesting facts about La Paz’s beginnings. Make your way to Calle Jaen; one of the oldest and best preserved streets of La Paz’s colonial heritage. The ghost stories and legends associated with this place are very entertaining. Our next stop will be Plaza Murillo (main square) where government buildings and a beautiful, colonial-style church are located. 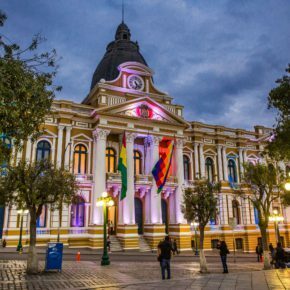 Learn about the most important facts about La Paz and Bolivia’s history and the current social/political situation. Personal purchases: beverages, souvenirs, etc.